It is not without reason that Casio watches come up in almost every discussion about hiking gears. Casio’s ProTrek line of products are inarguably the best when it comes to adventure sports and braving extremes of conditions. They combine technology with the latest fashion in a unique manner and end up providing a reliable performance to the user. 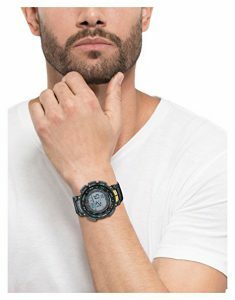 Casio ProTrek Pathfinders are the finest sports/ outdoor watches in the ProTrek line. Not only do they score high on performance and design, but also come at a relatively inexpensive price. For the more expensive model, check my Casio PRW2500T Review here. The Casio PAG240-1CR boasts of some essential features packed at under $200. If you are an outdoor sports enthusiast, this is the watch that you should consider next in your buying list. The design of the Casio PAG240-1CR Pathfinder can appear to be confusing and complex at the outset, but if you have used Casio watches before, or you are comfortable with technological innovations, this should not be so hard for you. The case isn’t too big and is made of quality resin that prevents damage from shocks and scratches. It is complemented with a plastic strap that is secured with a one pin securing mechanism. The strap isn’t particularly attractive, but you can opt for fancier alternatives anytime and get it changed from a local store. Although this model is water resistant up to 100 meters, it is recommended not to challenge this feature. The arrangement consists of three buttons on the right side of the case for the triple sensor – one for the compass, one for the barometer and another for the altimeter. There are four other buttons that help you to adjust the different modes and switch the backlight on and off. If you find it too difficult initially, you may consult the manual that comes with it in order to comprehend the configurations of each of the buttons better. Just like other Casio watches, the buttons on this one too are large enough to be activated while wearing gloves. The watch comes with a fully digital display along with what Casio calls ‘duplex’ LCD. Functionally, it is simply two different layers for displaying more than a single function simultaneously. The display is clear and crisp – a fact that is of immense assistance during outdoor ventures. Importantly, the second LCD layer does not reduce display contrast noticeably. The most remarkable thing about the Casio PAG240-1CR Pathfinder is the fact that it packs in a lot of features at an extremely reasonable price. In fact, it is one of the cheapest watches offering altimeter, barometer and compass features in the market currently. It is understandable, therefore, why its popularity peaked last year a few months after its launch. The triple sensors are an important feature of this watch. The ability to pinpoint your location on a contour map with three dimensions using a compass bearing and an elevation so that you can guess your location precisely even in absence of landmarks is something that has a lot of value when it comes to hiking. This watch has made it to my list of the best hiking watches for 2017. The Casio PAG240-1CR Pathfinder measures altitude in 5 meter increments up to 20 feet. The altimeter can also log up to 40 records of date, month, time, and altitude. It is efficient and accurate, and is an invaluable asset in navigation. Being barometric, the altimeter has to be re-calibrated once or twice a day at a known elevation so as to keep it in sync with alterations in atmospheric pressure and weather changes. The barometer’s performance in its ability to graph air pressures is yet another boost to the watch’s functionality. The compass comes with adjustable declination; so you can tweak it to record and follow compass bearings. The fact that the watch is solar powered implies that you will never have to change the battery. The watch consists of a small line of solar cells revolving around the outer edge of the display screen. All you need to do in order to keep the battery charged is to wear it under a light source. When not exposed to the sun, it can last up to 6 months. Designed for extreme sports, the Casio PAG240-1CR Pathfinder comes with a lot of other features too, most of which are too basic to talk about. Yet, it is important to mention the alarm being loud enough for most situations, and the countdown timer being reliable. Customers have complained that the countdown timer does not have the ability of counting seconds, but you cannot ask for everything at this price range. The full list of features includes world time, full calendar data, automatic backlighting, stopwatch, and thermometer among others. These features work just like they are supposed to, leaving hardly anything of mention here. 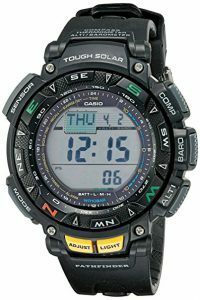 The Casio PAG240-1CR Pathfinder is a watch designed for the active outdoor sports enthusiast who is not too keen on compromising the quality and functionality of navigation controls as well as the utility of having a solar powered battery, but has a restricted budget of no more than $200. Casio watches have always been envied for their design and technological prowess, and this model is no exception either. It may seem a little complex at the beginning if you haven’t used military watches before, but as time goes by, you’ll get acquainted with all the features this watch has to offer. The question of whether the Casio PAG240-1CR Pathfinder is the one for you can only be answered after evaluating whether it meets your purpose and checks all your primary criteria; so it is of utmost importance to analyze the features and go through reviews as this before deciding to make a purchase.